Over the next few years, these photos collectively became what over 16 million people know as Humans of New York. When Stanton walked onto the stage of the University of Florida’s Phillip’s Center, the audience raised and roared in applause. He lit up the crowd with a few of the first pictures he ever took with his new camera and a story of how he sold one of the photos to his friend Andy for $300. That photo now hangs above Andy’s couch. He mentioned the time when someone asked him about the most pivotal moment in his life. He changed the picture on the screen to a photograph of two little boys on the subway. The room was silent for a moment as Stanton recalled the scene. Even sitting in the back of the theater I could tell by the way he gazed at his photo that this was the beginning of Humans of New York. Stanton explained as he was sitting on the subway in Chicago he saw two young boys with the same expression on their faces. Apprehensive about taking the photo, he argued with himself if taking photos of children was even legal; the audience laughed. But he did. He raised his camera and clicked as the lens shuttered. Though one of the boy’s mothers saw Stanton take the picture, he felt unafraid and accomplished. It was the first photo he took of what he called human interaction, something he said a photographer with over 20 years of experience wouldn’t have been able to do. By overcoming the fear so many have of approaching strangers and stepping into the unknown, Humans of New York evolved into what we all know it as today. To this day Stanton has stopped over 12,000 people for photos and has travelled to over 200 countries, but jokingly said that nothing is harder than stopping people in New York City. To understand how he gets those heart-wrenching and tender stories, instead of doing a traditional Q&A session, Stanton brought a member of the audience on stage and interviewed her. His first essential tips were to look for people who are alone and to never approach them from behind. Next, he’ll ask the person if he can take their picture, and before they get the chance to say no, he mentions he’s a best-selling author. Stanton proceeded by asking the volunteer, a freshman named Sarah, what her biggest challenge in life was right now. He continued with questions about the moment in her life when she felt the saddest, the most afraid and the guiltiest. Through his inquiry and her answers, Stanton explained that finding the story was about “the bubble” and breaking the barriers between strangers. More than the method behind captivating stories of humans of New York, Brandon Stanton had another story to tell—his. Before he became the man he is today, Stanton dropped out of the University of Georgia and went to community college. “Failure is a skill,” he said after mentioning how he f—ked up so many times that he showed up at his grandparents’ house with baskets of clothes because his parents wouldn’t let him come home. For many people, living in New York is the ultimate destination for expressing yourself through the medium you are most passionate about. Stanton remembered his room in the city as a mattress on the floor, but all he did was photograph: The creative outlet where his passions lay. “Following your dreams is not an excuse for hard work,” he said. 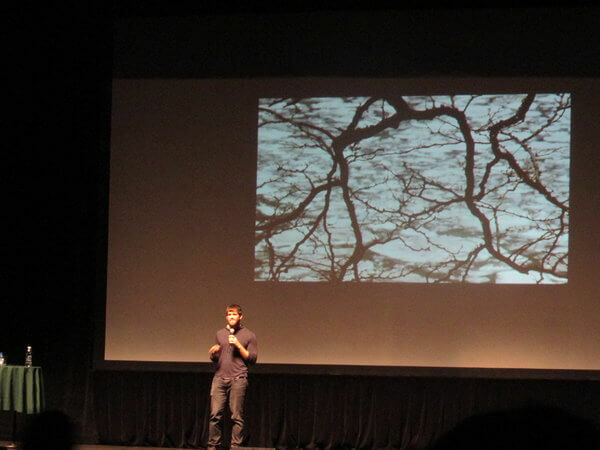 Pointing towards the audience, he encouraged each of us to experiment. If you think you’re not talented enough, after all this time and experience, Stanton admitted that many of his shots are taken in autofocus. Through commitment, drive and even feeling scared to take photos of children, Brandon Stanton cultivated Humans of New York. This project is no longer about the photographs, but the stories he unveils and shares with the world.